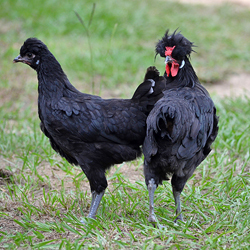 This remarkable table breed is considered a national treasure in its native France. Reputed to be the best-tasting chicken in the world, a roasted Bresse can cost hundreds of dollars at a Parisian restaurant. 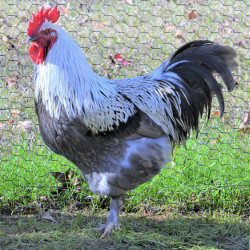 Greenfire Farms is the original and only importer of this extraordinary breed. This leggy French breed is prized for its exceptional meat quality. Its giant stature --it is the tallest breed native to Europe-- makes it one of the most awe-inspiring table breeds in the Greenfire repertoire. 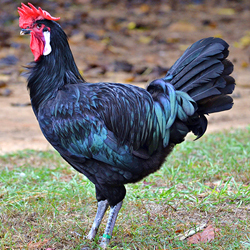 A beautiful and ultra-exotic French breed with a very unique look. A large breed with excellent taste. A large, ultra-exotic French breed. 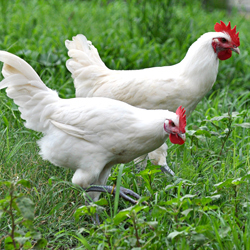 Known for its fine white meat and abundant production of white eggs. An adept free-ranging bird from France. This mid-size bird is known for its flavorful meat and gentle disposition. Reputed to lay the best-tasting eggs in the world, our Marans were directly imported from national champion French bloodlines. We breed imported black copper, blue birchen, and white varieties.